Designation: Ministry of Health, Kingdom of Bahrain. List of Author(s): Abdulla SF, Diotay DC. Copyright: © 2018 Abdulla SF. This is an open-access article distributed under the terms of the Creative Commons Attribution License, which permits unrestricted use, distribution, and reproduction in any medium, provided the original author and source are credited. The study aims to assess the effectiveness of monthly rosters in Ministry of Health in Kingdom of Bahrain: basis for development of staff E-duty roster. Specially, this study attempts to fulfil satisfaction the status and effectiveness of employers and employees in the departments in the Ministry of Health in the Kingdom of Bahrain in terms of quality of services, employee’s performance, employee’s satisfaction and cost effectiveness. The significant relationship between the status and the perception of the respondents as to the work in the Departments in the Ministry of Health according to the level of employee’s, the problems encountered by the employees in relation e- Roster satisfaction. Head Departments in the Ministry of Health have recommendations to resolve those problems by Questionnaires and interviews methodology were applied to describe the complexities between employees and their employers in the departments about the system. The study sampled a group of hundred (100) respondents, which comprise of employees in the departments which distributed as Two (2) employees from each department from radiology, laboratory, registrations, pharmacy and nursing having a permission to get their opinions by questionnaire. Ministry of health, E-duty, Employees, Employer, Human resources, Rosters employee performance, Employee satisfaction. Bahrain is keeping pace with technology and endeavoring to work on a proposal to facilitate the handling of staff by the administrator through the establishment of a system of Staff e-duty Roster. A roster system can be defined as a move made by a number of employees who give an order to know where should be their duty. They have to follow the instructions as listed. A roster system is software designed to plan and allocate shifts to available employees and to communicate it to them, often via email, SMS and etc. It aims to remove all the paperwork and take the process from manual excel to enter direct into system. Roster System is a system that provides the fastest and the most efficient way of storing and managing staffs’ leaves. This lessens the effort that is needed by the manager, in charge or those who need to pass on the information to the staff. This Roster System also serves as a data centre for all queries that the head department manager will request to evaluate and analyze. In addition to that, with the help of this system one can easily classify the staff based on position and title for each region. The information about the staff will be available in the data centre for the manager, in-charge or representative which they can access very easily in seconds from the department and sometimes it can be accessed from outside from the concerned departments as required. The technology which is used to build this application software provides a very effective solution and also it is very flexible to meet the exact needs of the organization. The current situation in departments of Health Centres in the Ministry of Health in the Kingdom of Bahrain is to manually insert data, where they do the enlistment of vacations or Leaves for the staff. This is a long process. The process of enlisting vacations and leaves is as follows: First the staffs has to write their vacation plan in specific papers provided by the department, and then send it to the in-charge. Second, the in-charge will collect the vacation requests at the end of every week and sometimes at the end of the day. They will then type it in computer by word or excel sheet in Microsoft office or write them by hand, in case the system is down. Lastly, they will analyze the gaps available. This long process of collecting date/vacation, typing manually or on computer in Excel Sheet, analyses the gaps offering and then communicating the same to the employee whether his application is accepted or rejected takes time for both employer and employee. This leads to impatience and then to dissatisfaction between employer and employee. A Roistering (or planning) framework is a vital apparatus for overseeing and is a utilitarian administration tool to control workers. The Roster framework provides a secure environment with interactive interface for the end users to interact and control the registration process, it also provides the ability to print and to make the report, generating the smooth functioning of the office. This system can be accessed by some users who have a username and password and is available for the manager, in-charge or those who are responsible for their departments. They will have the ability to track all the transactions and update their vacancies with simple and friendly instructions. Choosing the terms in statement of problems it is according to the needs of the departments in health centers in the Ministry of Health, the common terms which will be discussed is employee satisfaction and employee performance: It’s an important to use employee satisfaction to determine later on their performance and how employees feel about their company’s leadership, general work environment, training, and co- workers. It is basically designed to analyze the satisfaction level of employees within their work environment. Performing them offers a system to employees to specify how firmly they agree or disagree with the company and their jobs performance during the work. It is used especially when an organization reviews the opinions of the employees. What is the status of the monthly roster in the Ministry of Health in the Kingdom of Bahrain in terms of Quality of Service, Employee Performance, Employee Satisfaction and Cost Effectiveness? What is the level of effectiveness of the monthly roster in the Ministry of Health in Kingdom of Bahrain in term of Cost Effectiveness? Is there a significant relationship between the status and the level of expectations of the monthly roster in the Ministry of Health in Kingdom of Bahrain in terms of Quality of Service, Employee Performance, Employee Satisfaction and Cost Effectiveness? What recommendations can be proposed to improve the effectiveness of monthly rosters in the Ministry of Health in the Kingdom of Bahrain? There is no significant relationship between the status and the level of the effectiveness of monthly rosters in the Ministry of Health in in Kingdom of Bahrain in terms of Quality of Services, Employee Satisfaction, Employee Performance and Cost Effectiveness. The input, process and output model of system development processing is adapted as conceptual framework of the study. The (CIPP) context-input-process and product model of evaluation is developed as the best model that had value of evaluating the effectiveness of monthly rosters in the Ministry of Health in the Kingdom of Bahrain: Basis for development of staff e-duty roster. 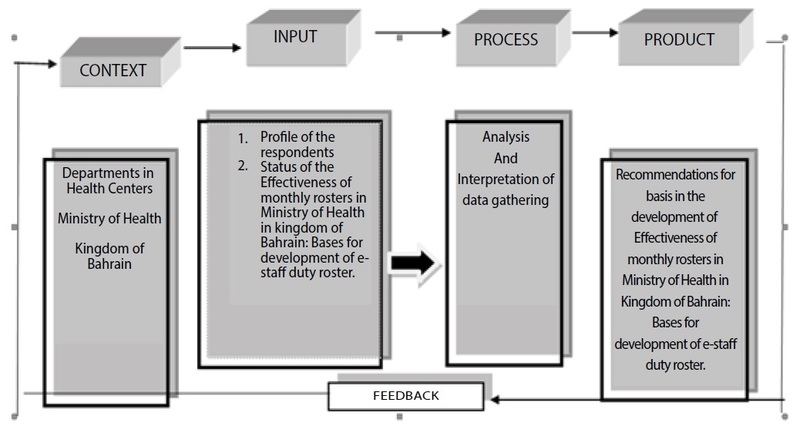 It illustrates the assessment of the effectiveness of monthly rosters in the Ministry of Health in the Kingdom of Bahrain: Basis for development of staff e-duty roster, and it is done by utilizing the descriptive method and questionnaires as tools for gathering data and finally the output are recommendations for basis in the development of strategic management program, Figure 1 is the conceptual framework of the study (CIPP) model. Top and Middle Level Management in the MOH: This research will be beneficial to the employees. It will be distributed to Health Centres in the Kingdom of Bahrain in a neat and accessible manner by the top or middle manager with alternative suggestions in case of emergency such as annual and sick leave or for delivery. Human Resources Department: The Human Resources Department will benefit from this study as the study will help to abandon the paper which is written by hand by replacing it with the one which is printed from the system with more accuracy in a clean and tidy manner. Department: The study will be significant to the administrator. By this study the Effectiveness of monthly rosters in the Ministry of Health in the Kingdom of Bahrain will be assessed. Employees in MOH: This study will show the effectiveness of monthly rosters in the Ministry of Health in the Kingdom of Bahrain. Future Researcher: This research will benefit the researchers who intend to do their research in the same area of the study. They will be able to develop because it will to be accessible to all anywhere, anytime and from many devices with having a new project management to develop it. This research work is done as a part of MBA program to fulfil the requirement of the University. The thesis is prepared in a limited time. It is for sure that research will have some limitations and it is normal. The study is limited only on assessing the effectiveness of monthly rosters in the Ministry of Health in the Kingdom of Bahrain in the level of satisfaction of employee in the Ministry of health in the kingdom of Bahrain. Especially, the study focuses on departments in the Health Centers in the Ministry of Health, during the period from 2013 to 2018. The major limitations of the study are as follows: Sample size: depends on the nature of the research problem. If sample size is too small, statistical tests would not be able to identify significant relationships within data set. The importance of sample size is greater in quantitative studies compared to qualitative studies. Literature Review is an important part of any research, because it helps to identify the scope of works that have been done so far in research area but for me it is only limited to literature relevant to the research area and lack of previous studies in the research area. Data Collection: There were difficulties in data collection where several employees included in the sample had difficulties in answering the questionnaire due to lack of English proficiency. Time: As a student who involves in other academic activities and having shift duty, had to face the time limitation where at times, and ran out of time in meeting projects tasks due to other pre- set priorities. Data Analysis: As my data collected hold a qualitative nature, it caused difficulties in data analyzing where I had to go thorough researches and try out different data analysis software such as SPSS in generating analysis conclusions. The study has much scope in the area of enhancing the performance of Health Centers based on employee satisfaction. As the study covers the implementation of the effective function and attributes of employee satisfaction, the study would be very useful to the overall leadership development and managerial empowerment in its entire means. For better understanding, the following terms which are used are defined as used in this study. Monthly Roster: A duty roster shows the work load for employees at work. The monthly Roster includes more than 100’s of employees distributed in 25 health centres across the Kingdom of Bahrain, This Roster is currently done manually by hand, which leads to disruption of work and the difficulty in entering or obtaining information quickly. E-Roster System: Actualizing an e-Roster framework appropriate to your association’s needs, so that it can convey productivity and conserve funds by discharging more opportunities to staff to obtain top notch benefits. Quality in Services: An evaluation of how well the administration will convey and adjust to worker desires. Cost effectiveness: The employer will assess the Effectiveness of monthly rosters in the Ministry of Health in the Kingdom of Bahrain in the basis for development of staff e-duty roster of how well a delivered service conforms to the employee expectations. Employee Performance: The work duty expected from an employee and how well those duties were executed. Employee satisfaction: Worker satisfaction is the measure which shows whether employees are happy with their occupations, their boss and their workplace. These things are immeasurably critical to specialists in their occupations in order to keep their workforce cheerful and perform better. The principle contrast between inclination rostering and self-rostering in this experiment is that the proposed timetables of the representatives in self-rostering need to fulfil work enactment, while in inclination rostering a calendar that fulfils all inclinations determined by the workers do not really infer that this timetable is permitted by work enactment. Evidence suggests that employees tend to be more jobs dissatisfied under rotating shift work than are those who work fixed schedules. This job dissatisfaction is commonly attributed to employees’ dissatisfaction with their hours of work . Thus, we propose that general affect, including job and rest time satisfaction, will improve following a change to a four-days-on, four-days-off, compressed shift-work schedule. The study utilized the descriptive type of research. Descriptive as a general term used to classify a study in which data shall primarily be used to describe, characterize or provide a picture of a research subject, the respondent and population. The descriptive approach is found suitable to pursue this research paper. The descriptive study used survey questionnaire and focused on the Effectiveness of monthly rosters in the Ministry of Health in the Kingdom of Bahrain: Basis for development of staff e-duty roster. Using survey questionnaire to administer survey research is a powerful tool that market researchers use to gather data. Advanced survey questionnaire providers have survey solutions for all modes of survey research, including: online surveys, paper surveys, phone surveys, to the more recent introduction of mobile surveys. Available survey solutions have led to widespread use of quantitative surveys, across all survey modes, to collect, analyze, and use data to formulate strategies for a more effective business model, create targeted marketing strategies, enhance customer service, and much more. Executed correctly, survey research can benefit market researchers with reliable. Cost: Surveys are relatively inexpensive; the cost per response is far less in the cost of administering a paper survey. Extensive: Surveys are useful in describing the characteristics of a large population. No other research method can provide this broad capability, which ensures a more accurate sample to gather targeted results in which to draw conclusions and make important decisions. Dependable: The anonymity of surveys allows respondents to answer with more candid and valid answers. To get the most accurate data, you need respondents to be as open and honest as possible with their answers. Surveys conducted anonymously provide an avenue for more honest and unambiguous responses than other types of research methodologies, especially if it is clearly stated that survey answers will remain completely confidential. The study sampled a group of hundred (100) respondents, which comprised of employees from various departments. Two (2) employees each from the department of radiology, laboratory, registrations, pharmacy and nursing having a permission to get their opinions by questionnaire. The goal of the survey was to determine the rotation between employees. The sampled groups of employees were chosen with a vision to get the clear point of view from the side of employees on how they feel about their job duties and the quality of employers’ process. The employer was also approached to get the perceptive of management on their overall performance. The sampling was based on Quota sampling. There will be a population. First segmented into mutually exclusive sub-groups, just as in stratified sampling. Then judgment is used to select the subjects or units from each segment based on a specified proportion. Quota samples would be of 100 employees by using a well- structured questionnaire. The data was analyzed by using various statistical techniques and tools such as SPSS. Also there were two types of respondents, employees and employers to get the perception of both employer level and employee level. In addition face to face interview made among the employees and employers in the Departments – of Health Centers in Kingdom of Bahrain. The data gathering stage was conducted right after the research instrument validation. The researcher needed the approval and permission from the university to conduct the study. A letter was prepared to seek necessary permission and it was submitted to the Ministry of Health (Directorate of Health Centers). Questionnaire: The questionnaire was designed with open ended questions with an objective of collecting opinions of the respondents. The questions were made based on the statement of problem. The questionnaire used the Likert scale including option of a Strongly Agree, Agree, Moderately Agree, Disagree and Strongly Disagree (Table 1). Table 1 The questionnaire used the Likert scale including option of a Strongly Agree, Agree, Moderately Agree, Disagree and Strongly Disagree. In this study the questionnaire was reviewed and amended by the thesis advisor. In order to ensure the quality of the questionnaire as an instrument for data collection, the researcher collected the opinion and suggestions of jury of experts. Kindly rate or evaluate the research instrument using the rating scale according to the following criteria set forth by Calter V Good and Douglas F Scate, after jury of experts my questionnaire get Agree with a result of 3.85. The questionnaire survey results were analyzed using analytical tools such as statistical package for social sciences (SPSS). The information collected was tabulated and analyzed by the researcher using these analytical tools to get a proper weighted means result. The measures are graded from 1 to 5 degrees, the length of the range of averages of consciousness is first calculated as follows: Length of range of arithmetic averages: 5-1=4. The length goes for each level of the five levels: 4÷5=0.80. Along these lines the degree goes is the main level: 1+8=1.80, and so on. For objective1, which determined the status of the monthly roster in the Ministry of Health in the Kingdom of Bahrain, the interpretation in Table 2. Table 2: The interpretation table contains the status of the monthly roster in the Ministry of Health in the Kingdom of Bahrain. For objective 2, this determined the level of effectiveness of monthly rosters in the Ministry of Health in the Kingdom of Bahrain: basis of development of staff e-duty roster, the interpretation in Table 3. Table 3: 5-Point Likert Scale Used to Measure the level of effectiveness of monthly rosters in Ministry of Health in Kingdom of Bahrain. For objective3, this determined the significant of relationship in the status of effectiveness of monthly rosters in the Ministry of Health in the Kingdom of Bahrain by using the Correlation Analysis. Table 4 demonstrate the weighted average mean value for the status of Effectiveness of monthly rosters in the Ministry of Health in the Kingdom of Bahrain. Employee Performance has the highest mean value 3.156 Moderately Agree, while the cost effectiveness has the lowest mean value by 1.950 Ineffective and the rest monitoring that the employee satisfaction and Quality of Service have an average mean value 2.810 and 2.154 respectively which is Moderately Agree and Disagree. Table 4: Table demonstrate the weighted average mean value for the status of Effectiveness of monthly rosters in the Ministry of Health in the Kingdom of Bahrain. It is recommended that the in-charges should make significant efforts to identify the weakness in their current situation and work hard to improve the system. They should ensure the effectiveness of E-Roster and to make it simple to use in order to ensure that employees understand it. Furthermore, it is recommended to increase the awareness of employees about the implementation of that system, and also, it is recommended that IT department should hold meetings and communicate with head of the departments to study the proposal and see how the system will help improve employees’ effectiveness. After the distribution of the survey, I got some recommendations from the respondents to the new proposed system. To start with, to make it fast. Also, to make an option to solve the emergency cases, to have a quick response by using good quality programme. The system must have clear error messages and options. Also, to become faster and solve the emergency problems that happen rarely. Each employee must have limited authorization, to add call list for employee data to contact each other, to be developed to manage through smart phones, to have unlimited access to the system. It is important to be secure and sufficient. It should have the ability to add common codes. It must be saved directly with high performance. It should give notifications for all users if there are any changes. It should be a good source training for staff. Finally, to enhance the network. It is recommended that effective utilization should be made of the ministry resources and new programmes should be developed with new performance evaluation ways to be made for staff. Furthermore, professional IT technicians should be used efficiently and effectively to minimize the errors at all stage with high respondents. In all cases, we must ensure good training program to increase the efficiency of the employees. Likewise, the system should be updated regularly and errors in the system should be fixed in response to a problem encountered by respondents, and finally employees should be empowered to be more efficient. Future research students should upgrade and update their knowledge, use new developments in technology and further upgrade the system. They can study the recommendations in this study and should act according to those recommendations to enhance the service in such a manner, so as to improve the existing system and devise a new upgraded system to help the government to work more efficiently and to be able to provide quality health care system in the most efficient and cost effective manner.